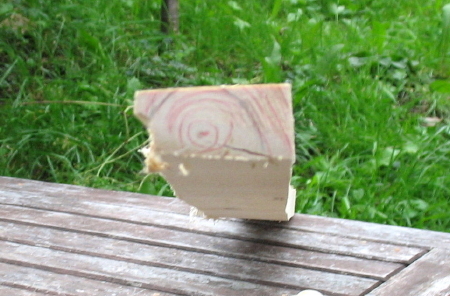 Decrowning a bow-stave is a very useful way for to take advantage of small- diameter saplings. Hawthorn, blackthorn, spindlewood, for to call a few of real super- bowwoods are shrubs or bushes, sometimes they grow to the size of small trees. Making bows of them is a delicious job for a bowyer, due to their small diameters they are high-crowned. 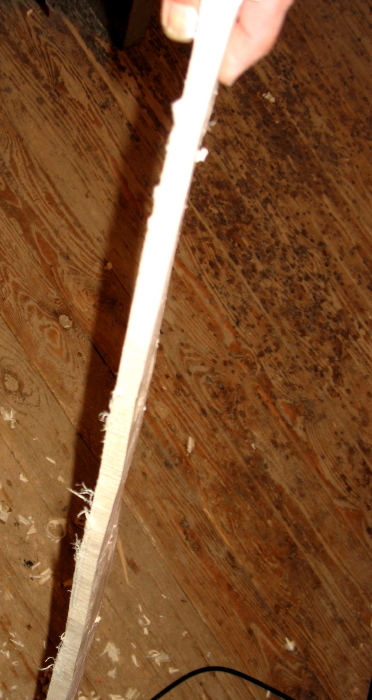 High- crowned staves are a good choice for a longbow, but if you want to make a flatbow of such a stave you need to decrown it for to get a wider back. Look at the cross- section and choose the growthring on top of the stave (the back of the bow), is it running through the whole length? If not, take one growthring deeper………..This growthring is a kind of guide to follow all over the stave lengthwise. It´s almost the same story like to cut a whole growthring, follow the growing of the wood, every bend and curve and knot, the top of the growthring in the center of the sapling is the guide. 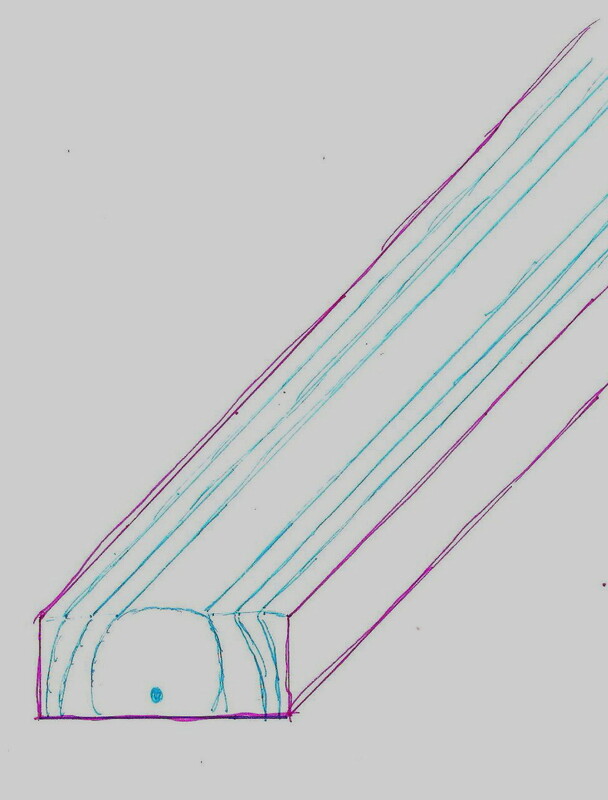 It is very important to do the decrowning very equally, so the top of the growthring in the center has to be cut out in equal width all over the length, just as well as the other cutted growthrings. A perfectly decrowned back should look very harmonically. Look again at the drawing above: the sidecuts of the outer growthrings are paralleling the top of the center- growthring. The more perfectly you decrown the more stable the bow will be and it will bend more even, otherwise you could end up at some twisted limbs. Even decrowning is some delicious job to do, it is very worth for to know it. Otherwise a lot of great staves would be fire- wood or fence- posts. Mindful readers of the bowXplosion know this bow. It´s one of the bows I used as a sample for to post heat- treating as a great way to enforce and to shape a bow. 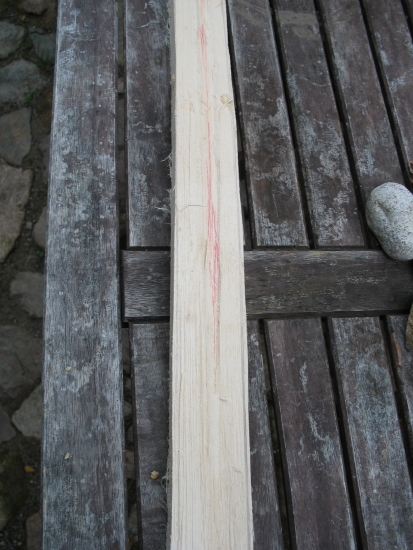 Next volume will be on some samples and more how- to pics of decrowning bow staves.